well, she's calling it a hampster... I'M calling it reggie. I wonder how long it's going to take the cat to figure out that the little critter is actually lunch. Ahh! He is totally adorable! get better soon! i love the pearl stalking photo... it's pretty darn cute! So cute! I can't believe how little he is. Thanks for posting the pictures. Can you share pictures of Reggie's habitat? We are total animal lovers & you've given me the hedgehog bug. I found a breeder that lives about an hour away & her babies will be weaned mid-October so now I'm spending every available second researching these little cuties! 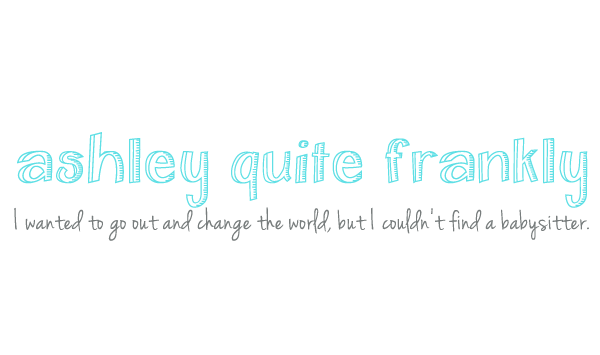 I think I'm in love. Oh my gosh, he is so tiny and cute. I love him. I want one. :( But I don't want something else to take care of. He is such a doll! I think Pearl will come around when she realizes that Reggie can up her in the pain department. 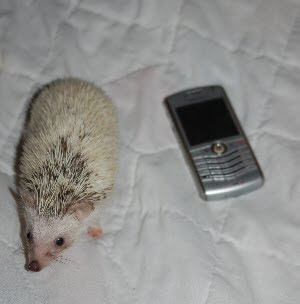 I had a friend who had Sonic the hedgie years ago, and absolutely loved him. I love that you are cuddling and handling him a lot because they had to use gloves to hold their little guy and that isn't nearly as fun. Good luck with him and hope you're feeling better. 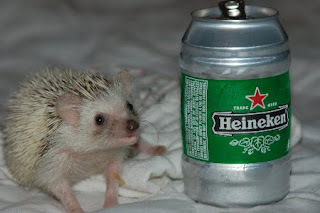 He's a little young to start drinking. Wow, he's a little guy, so cute! Can Reggie come play at my house? He is SO cute! Do you let him roam around, or does he live in his "cage" until you take him out to love on him? is that as big as he'll get? I can't stop worrying about Pearl killing that hedgehog. That would be terrible. The clay Reggie is adorable! She could easily make that a hedgehog. Hippy, I'll get a pic of his cage later--it was cheap and easy and so far he's super easy to take care of. I don't think Pearl can eat Reggie. 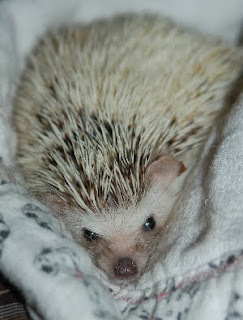 He is unbelievably spiky when he gets mad and it really scares her. 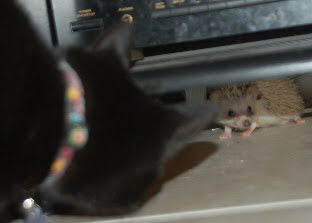 She was actually trying to be friendly last night but he got all prickly and rolled into a ball and it freaked her out. She's also not much of a predator and never has been.